You've got a gas-fueled hearth appliance because you enjoy the warmth and ambiance of an open flame, but don't want to deal with the hassles of wood. 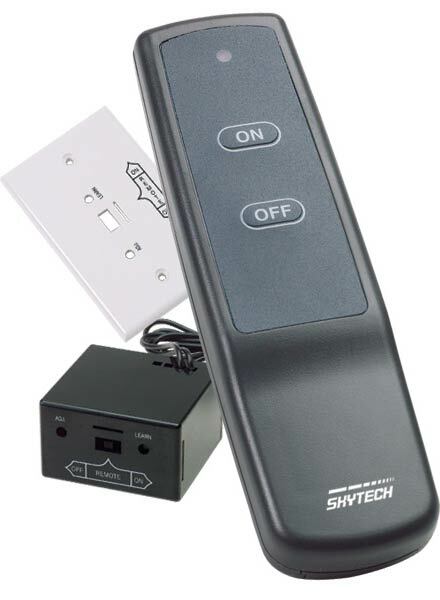 So why not make using your fireplace, insert, or stove even more convenient with this SkyTech 1001 Millivolt On/Off Hand Held Remote Control. This remote allows you to provide yourself with heat and a cozy atmosphere by pushing a single button. What type of battery does this take? This answer and other information you will likely find useful will be located in this installation manual. The remote uses a single 12v A23 battery and the receiver uses 4 x AA batteries, to answer your question. Will the Sky Tech 1001 receiver replace ECS R- 5797 receiver? This will not work as the R-5797 system is made for use with latching solenoid Hi/Lo valves and provides flame control, however, the SkyTech SKY-MRCK Rotary Adjustable Flame Height Remote Control should serve as a suitable replacement. Does the above item include a receiver? The above item does include the transmitter and the receiver. This works like a charm and easy to install. Hook it up and change the batteries (on occasion) it's set it and forget it. Great product! Easy to install. Works well. I would definitely recommend it! Product delivered promptly and in fine shape. Price was right too. Product works great. Fast shipping. Remote Control unit works great! We purchased a SkyTech 101 remote control for use with our Dexen MVK-EI electronic ignition natural gas Safety Pilot Valve Kit. It was easy to install and has worked reliably. Its a great convenience to be able to start our gas log fire remotely - even from across the room. Very easy to install , sync to remote control only took one try and it was a two minute project . This remote is simple and straightforward. We purchased it to replace the remote that came with our fireplace. It doesnt have a lot of features, but it works great for basic on/off control. It is easy to install, and the price was very cost effective. We read the instructions and thought we had done everything correctly, but somehow the transmitter and receiver were not communicating. The code did not work even after we tried all the troubleshooting suggestions. Not too big, not too small, this remote is just right! It is very simple: turn it on, or turn it off. Nothing complicated here - its perfect! I was very impressed with the instructions for this remote set. We had it installed and working within 5 minutes - it was very easy. We are very happy with this product, and the fast shipping. Once we configured the receiver it worked perfectly on the first try. We were very impressed with the easy set up and quick delivery. We found this remote when looking for a replacement for our old one. It is much simpler to use because it doesnt have to be programmed. Just put it in and turn it on! It was so easy to install I could do it myself. I am very happy with this kit. It comes with a wall clip and works great for igniting fires. Unfortunately, I had to replace mine after leaving the battery in over the summer. Batteries tend to leak if left unused in a device for a long period of time. My mistake! I got a new one and it is working just fine. This remote does exactly what it is supposed to. We had an electrician install it, just to be safe. It works great, and the price was reasonable. I highly recommend this remote. It is easy to install and worked great the first time. The price was excellent, and I would purchase it again. This is one of the most widely used remotes on the market. I have installed them in fireplaces from many different manufacturers. They work great and are simple to connect. This is a great product for the price I paid, and I am very happy with it. It does what it is supposed to turns the unit on and off. It couldnt be simpler to install and took all of 5 minutes to put it in the fireplace. I put the batteries in the remote, pushed the button, and it turned on! This was exactly what I needed! This is a great remote; it is easy to use, and simple to set up. It was just what we wanted! The funny thing is, I didnt need a new remote but I had to rule out all the pieces that could have been broken. Turns out I had a faulty thermocoupler. Oh, well! Its fixed now, and I love the new remote. This remote works like a charm in my see-through fireplace. It was easy to set up, and works from both sides. I love it!